Parigi – Dopo la magra figura rimediata in occasione della Coppa America del 2007, i cinesi hanno deciso di riprovarci. Questa mattina, infatti, Wang Chao Yong ha presentato la seconda sfida all’America’s Cup proveniente dalla terra dei dragoni. Una sfida di cui è presidente, supportata dal Governo di Pechino che, a differenza della prima, variegata dai colori francesi, sarà a chiara matrice cinese. “Le barche saranno disegnate dai designer del team e verranno costruite in Cina – ha spiegato Wang Chao Yong nel corso della conferenza stampa – Sono già diversi mesi che stiamo lavorando allo sviluppo degli scafi e dell’ala rigida con l’appoggio dell’Università della Cina. Crediamo che questa sia un’occasione unica per dimostrare le competenze dei nostri ingegneri specializzati in idro e aereodinamica. Il varo del primo AC72 è previsto per l’inizio del 2012”. Wang ha poi parlato del sailing team, specificado che: “La prossima Coppa America vedrà impegnati i migliori velisti sulle barche più veloci. E’ per questo che siamo orgogliosi di essere parte di questo grande gioco e ci saremo con un equipaggio in gran parte composto da velisti cinesi”. Thierry Barot, CEO di China Team che già era stato ad Auckland per vedere da vicino il primo AC45, ha aggiunto: “Ad occuparsi della formazione dell’equipaggio, il larga parte composto da velisti cinesi, saranno alcuni grandi campioni della vela olimpica. Siamo davvero fortunati a poter contare su allenatori con competenze del genere”. “Siamo contenti di dare il benvenuto a China Team, ottavo sfidante ufficiale alla 34ma America’s Cup – ha commentato Richard Worth, presidente dell’America’s Cup Event Authority – Si tratta di un ingresso importante, perchè introduce un nuovo continente, e nuove opportunità di marketing, nell’ambito dell’evento che stiamo allestendo”. [America’s Cup Press Release] For the second time in America’s Cup history, China has entered a team to challenge for the oldest sporting trophy in the world, and bring it to China. China Team, with the full support of the Chinese Government, is the 8th challenger for the 34th America’s Cup, joining the best sailors in the world to compete in the Challengers Series Louis Vuitton Cup, to reach the America’s Cup final, in San Francisco during the summer of 2013. Mr. Wang Chao Yong, chairman of China Team, is delighted to lead the challenge for the second time and believes that he has put in place a team of experts who will lead China Team to greatness. “All boats need to be designed by the team, and built in country. We have been working with some of the best worldwide designers for hull and wings for a few months already, in partnership with top Chinese Universities. This is an opportunity to showcase China’s talents in the leading-edge hi-tech areas of both hydrodynamics and aeronautics. 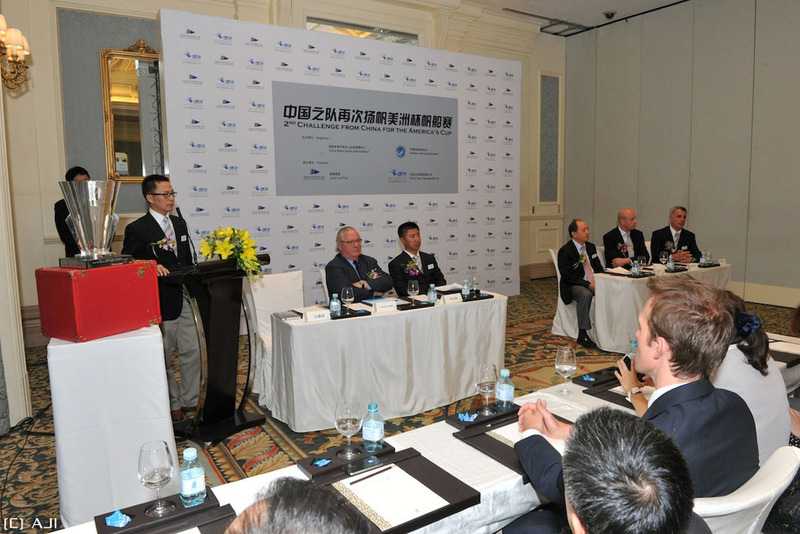 Our boat will then be built in China, and ready to sail by February 2012,” said Mr. Wang. The 34th America’s Cup has taken a big step into the future, with teams sailing the AC72, a very hi-tech, wing-sailed multihull. These catamarans are the equivalent of the Formula One cars for the seas. “This America’s Cup will feature the best sailors on the fastest boats, so we’re very happy to be part of this adventure with China Team, a boat which will truly represent China, as most sailors will be Chinese”, Mr. Wang added. Thierry Barot, CEO of China Team has been busy recruiting the worldwide and Olympic champion sailors who will be responsible for training the sailing team. “Our boat will be powered mainly by Chinese sailors, and we are very fortunate to have an elite team of international sailors to come to China and train our Chinese team”. Another new addition to this cup is the America’s Cup World Series, a circuit of races around the world which will provide sailors with more opportunities to compete with one another, and also build excitement for each home team over the next 2 years. Louis Vuitton, America’s Cup long standing main partner, is delighted to welcome a strong Chinese team China Team led once again by their friend Wang Chao Yong who will fly the Chinese colors on the seas. In 1421, sixty years before Columbus, China hit the high seas with a vast armada of impressive sailing ships. These seamen were the ancestors of the young 21st-century sailors we see in China today. “China has a 600-year-old tradition of sailing!” said Yves Carcelle, Chairman and CEO of Louis Vuitton, speaking of the new Chinese team entering the America’s Cup. “They will have to win the Louis Vuitton Cup and beat all the challengers before getting a chance to compete against the American Defender, Oracle Racing. Just the kind of challenge the Chinese relish!”.